This is now the fastest Panamera that money can buy....a very large sum of money that is. All that time spent dreaming up what Porsche had planning for the second hybrid rendition of the Panamera has paid off because true to the elusive hints, the German automaker has just released the Porsche Panamera Turbo S E-Hybrid ahead of its official showing at Geneva next month. As we predicted, this Panamera comes with the same 136 horsepower electric motor as the lesser E-Hybrid except this time it’s mated to the 4.0-liter twin-turbo V8 from the Turbo S rather than the 2.9-liter twin-turbo V6 from the 4S. With the gasoline engine adding 550 horsepower of grunt, the Panamera Turbo S E-Hybrid churns out an eye-watering 680 horsepower with peak torque, which sits at 626 lb-ft of, being available just above idle. Porsche has rightfully designated this hybrid, engineered with all-wheel drive hybrid technology from the 918 Spyder, as the flagship Panamera. And rightfully so because asserting its dominance is a 0-62 mph sprint happening in 3.4 seconds, besting Porsche’s 0-62 mph time for the Turbo S by 0.2 seconds. Top speed is 193 mph, just two mph more than the standard Turbo S. Regardless of how fast this Panamera is, Porsche has ensured that it will politely putter around town when not in race mode. That's because the Panamera starts up in all-electric E-Power mode, enabling the 14.1 kWh battery to power the party without help from the V8 for up to 31 miles of emissions-free driving. Once the juice is out, or if the driver wants brisk acceleration, the Porsche automatically switches into Hybrid Auto mode, coaxing the powerful V8 to life. Comfort will also be of paramount importance, with a three-chamber air suspension coming standard along with a bevy of performance goodies, which include carbon ceramic brakes, Porsche Dynamic Chassis Control Sport, a torque-vectoring differential, power steering, 21 inch alloy wheels, an eight-speed PDK transmission, and adaptive aerodynamics. Buyers will be spoiled for choice because the Panamera Turbo S E-Hybrid will debut in two wheelbases, standard and Executive, the latter of which will get a rear-wheel steering system to allow the driver to better guide the 150mm of extra wheelbase around corners. Owners concerned with protecting the environment (let’s be honest, some buyers will opt for the hybrid model simply because of the extra performance) can rejoice in the fact that the Panamera can charge its battery in 6 hours using a 10 A, 230-V connection or in as little as 2.4 hours when a 7.2 kWh (versus the standard 3.6 kWh), 32 A connection is available. Price, as you may have guessed, will be exorbitant, with the standard model starting at $196,593. 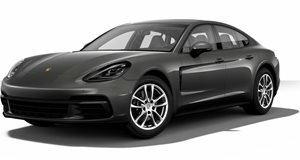 The Executive sedan commands a $210,826 starting price, and we can expect that to quickly ballon given Porsche's habit of making its options list enticing yet massively expensive. European customers will have the first pick when the Turbo S E-Hybrid goes on sale in July of this year while the top-tier Panamera's worldwide debut will occur in the second half of 2017. One thing Porsche hasn’t detailed is the Turbo S E-Hybrid’s track numbers because as we can imagine, a V8 engine, battery, torque vectoring differential, luxury amenities, and the potential for a longer wheelbase that utilizes rear-wheel steering, is not the recipe we'd pick for a lightweight track vehicle. Then again, Porsche has surprised us in the past by using its engineering prowess to magically make bloated vehicles a dream to thrash in the corners. Let’s hope this is one of those instances.